Migraines are common, affecting 1 in 4 females and 1 in 12 males in the UK and should not be confused with a ‘really bad headache’. Although it may be severe, the headache is normally associated with other unpleasant symptoms, such as nausea, vomiting, sensitivity to light and visual problems. Suitable for people who have previously received a doctor’s diagnosis for migraine. Used to lessen the frequency of migraine attacks. Native to the Balkan Mountains, Feverfew has been used for over two millennia as a traditional herbal medicine. Fresh Feverfew leaves are occasionally eaten, or made into tea. With its dainty daisy-like yellow and white flowers, and its zesty-fragrant leaves, Feverfew makes a wonderfully decorative garden plant. 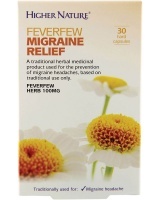 Higher Nature Feverfew Migraine Relief - used for the prevention of migraine headaches, exclusively based upon long-standing use as a traditional remedy.